I was adamant that I wouldn’t potty train Bow until he was nearly 3. I started potty training Bob when she was 2 and 3 months but it was very stressful and I think that is because I tried to do it too soon. I have many friends who waited until their children were nearly 3 and they all seemed to get it within a week. 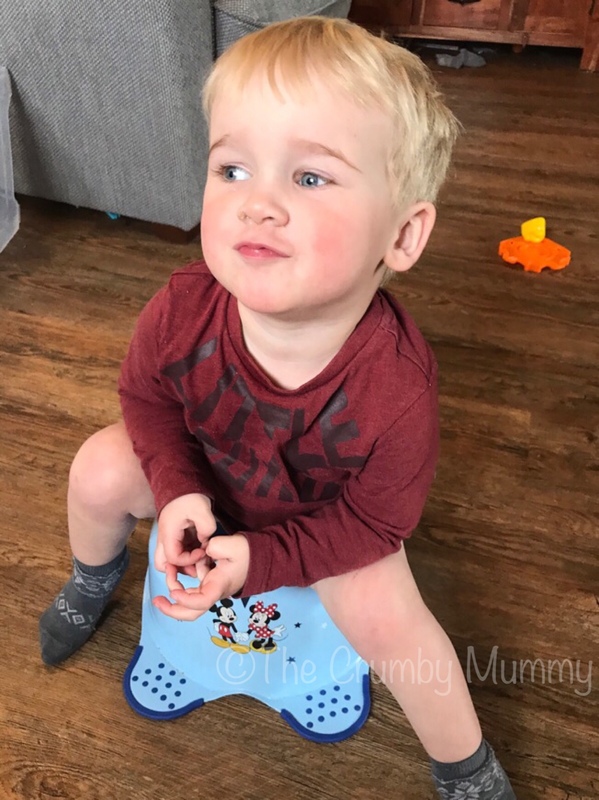 Recently Bow has been wanting his nappy changing every time he does a little dribble. I knew this would get very expensive so I bought a potty to see how it went. I was happy to take it steady and wait a while if needed. Bow used his potty occasionally and he was very excited. He would do a little dribble, jump up and celebrate and then sit back down to finish it off. Every time he used the potty he got to put a sticker on a chart. He loved this part too. Bow also started taking an interest in Bob’s big girl pants so I also picked up a pack of Paw Patrol pants. I hadn’t planned on using them straight away but he spotted them and wanted to wear them. I wan’t worried as I knew if it didn’t work he could pop his nappies back on. The Paw Patrol pants were used in the same way as a nappy. It wasn’t pretty. When we were down to our last pair of pants I tried to get Bow to put on a pull up. These were just plain pull ups, not the exciting Disney kind. He was having none of it! He refused to put one on and kept crying for his ‘Paw Paw pants’. I didn’t know what we were going to do. If Bow would never wear a nappy again we were in trouble. I ended up making a mad dash to the supermarket to buy some Huggies Pull Ups, hoping the picture of Lightning McQueen would sway him. When I returned home I made a big fuss of the ‘big boy Cars pants’ that I had found and luckily it worked! Bow was happy to wear them and I was very relieved! Since then he has been wearing his pull ups and using his potty occasionally. Yesterday afternoon he did really well! He ran around without his nappy on and used his potty every time he needed too. We even had our first poo on the potty! I am happy to take things steady this time around. We have pull ups, we have a potty and we are just going to see how things go. If you would like to read Bob’s Potty Diaries cluck the button below.